If the new Galaxy View is any sign, Samsung has a new policy for hardware: license the ordinary stuff to B&N, and keep the stupendous ideas for themselves. Initially teased last month at IFA Berlin, the Samsung Galaxy View is an 18.5" Android "tablet"which is so large that it comes with its own kickstand. 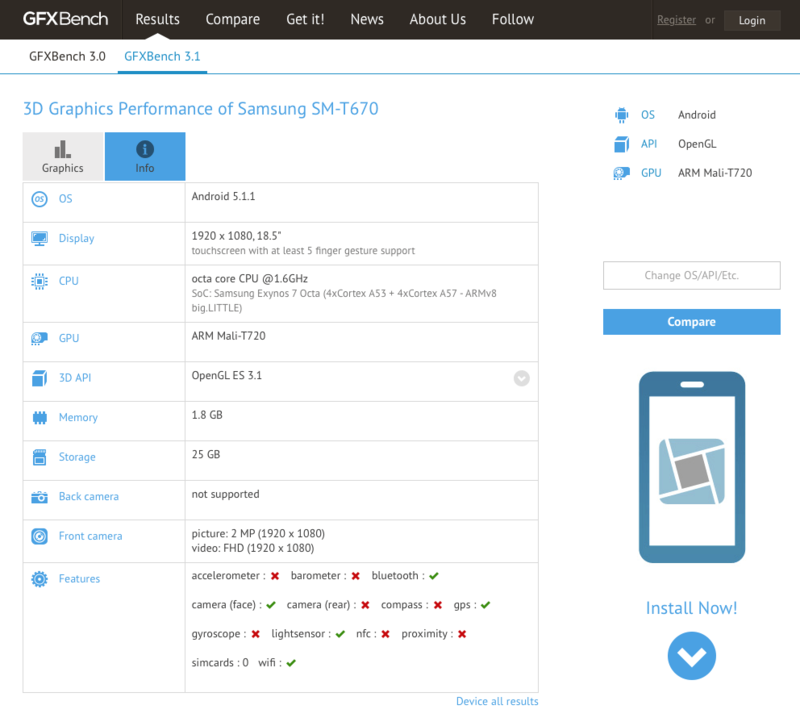 Few details were released last month, but thanks to the benchmark site we now know that the Galaxy View (model number SM-T670) runs Android 5.1.1 Lollipop on a 64-bit octa-core Samsung Exynos 7580 processor with Mali-T720 GPU, 2GB RAM, and 25GB internal storage. The 18.5" screen will have a resolution of 1920 x 1080. The listed specs also mention a single camera (2MP), Bluetooth, Wifi, GPS, and a light sensor. There's also an earlier leak that said this tablet will have an 8MP camera, a microSD card slot, and feature a 5.7 Ah battery. No price or release date has been announced at this time. Samsung is going to market the Galaxy View to be used in classrooms, offices, and living rooms. It's going to be a little small to be hung on the wall and a little large to be set in your lap, but with Samsung's quality and brand behind it, the Galaxy View should still find buyers. The Samsung Galaxy View isn't so much a tablet as it is the latest entrant into a new product category. Sure, it's going to have a battery, so technically it's a mobile device. 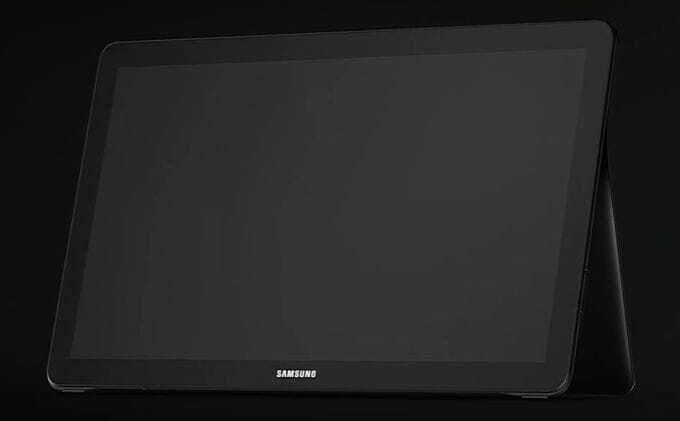 But like the earlier large tablet models (including the 65" Fuhu Nabi BigTab), Galaxy View is more of a cross between an all-in-one PC and a Smart TV. It's not so much a tablet as it is an alternative to Google's Android TV platform that Marvell first showed off at CES 2014, and to the Fire TV. Yes, Amazon's Fire TV is set top box, but when plugged in to a TV it serves some of the same needs as the Galaxy View. Both are intended to be used in living rooms, making them competitors. It's just that one is more mobile while the other is more portable. Back in 2005, I bought an HP laptop for 1200 dollars roughly. It was a convertible with Wacom pen. It was 12 or 13 inches, had a 1280×800 non ips screen. It was so bad, when you laid it down flat to write or draw on it, it would wash out and you couldn’t see everything. Fast forward to Ipad. It had crappy resolution, but an IPS panel. You could lay it flat. You could see everything without the loss of color. Then Apple started raising the bar and resolution on screens. Everyone determine to have the same kind of draw followed suit. It was wonderful. What is the point of this post. I’m watching the screens lately on these products sliding backwards. So far no washed out loss of color but the resolution is the first to start and take a hit. OEM’s are cutting specs to bring cost down and I hope we aren’t headed back to the old times where you had to buy a Professional model to get a decent screen.